Do you need a fast meal that’s full of flavor? Stir-frying is your answer. The beauty of cooking your veggies Chinese-style is all in the stirring, the high heat and the distinct Chinese flavors. The heat locks in the flavor and the stirring ensures that your vegetables stay tasty, crisp and colorful. One mistake people make when cooking Chinese food is the amount of oil they use. It seems that the high heat encourages us to pour in more oil. Instead of being put to use, the excess oil leaves our veggies drenched and overpowered by greasiness. As you are going to stir-fry your veggies over a high heat for a short amount of time, you need those veggie’s chopped into bite-size pieces to ensure they cook properly! Place your vegetables on the chopping board in time order so when you’re cooking you don’t have to think about which veggies to reach for. Before adding your oil, get that wok hot by turning up the temperature to a medium to high heat or high heat. As your wok starts to smoke, that’s when it’s time to throw in your veggies. Add around 1 tablespoon of oil, as stir-frying uses high temperatures in a short amount of time, it is best to use oils with high smoke points like, canola, coconut, peanut or sesame oil. Place the veggies that take the longest to cook in first, these are veggies like, onions and peppers, broccoli, carrots and cauliflower, throwing in lighter vegetables like cabbage, bok choy, celery and, mange tout in last. Turn up the heat by adding a bit of spice to your dish, add freshly chopped chilli and Sichuan peppercorns – your stir fry will be rich in flavors as well as aromatics! Add a little texture to your dishes by adding nuts like cashews and peanuts, for a bit of recipe inspiration, take a look at this delicious kelp noodles in a peanut-miso sauce recipe or this carrot and courgette noodle stir fry. By pushing the veggies around the sides, you will create a well in the center of your wok ready to cook up your sauce. Create a funky sauce by using a base of soy sauce, water, lemon, maple syrup, rice vinegar and oil. You may need to add a little corn starch to thicken the sauce a little. 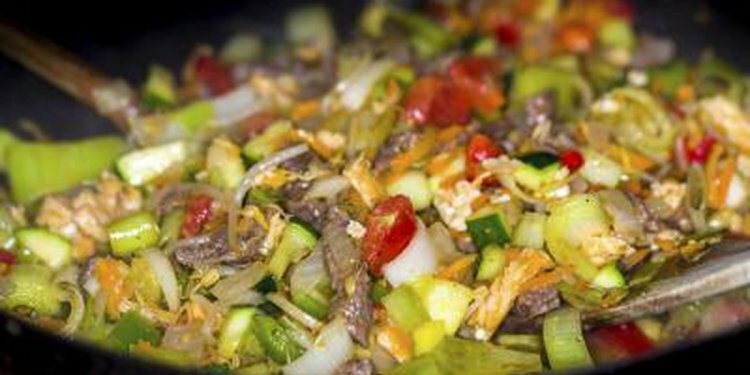 Allow the sauce to cook in the well in your wok, once thickened slightly, slowly stir in the vegetables into your sauce. Serve immediately with rice or noodles. You may want to add garnishes like finely sliced scallions, flaked almonds and a wedge of lemon.